Judge Holly Williamson was sworn in January 1, 2009 as Harris County Justice of the Peace. Before being elected to the bench, Judge Williamson practiced law in the Federal Courts, State District Courts, and JP Courts. With 14 professional clerks and a budget of over 1.3 million dollars, Judge Williamson presides over approximately 20,000 cases a year including: civil and criminal; jury and bench trials; traffic cases; hot check cases; evictions; probable cause hearings; administrative hearings and truancy court. 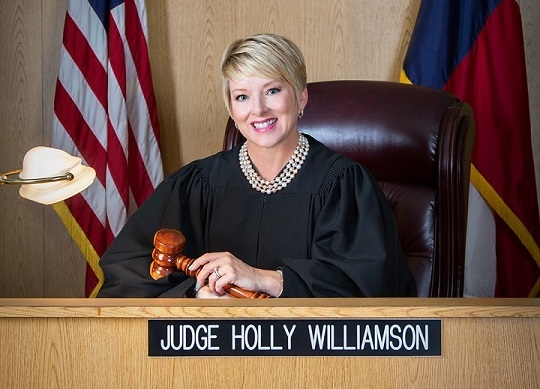 Judge Williamson truly enjoys serving in the â€œPeopleâ€™s Courtâ€ and strives to make a difference in the lives of many, particularly the kids formerly through the Stay in School Program and now in the new Truancy Court created during the 84th Texas Legislative session. The new Truancy Court emphasizes early intervention to attain its goals: to increase student attendance in Harris County schools, to reduce the number of students dropping out of high school, to reduce juvenile crime, and to identify students and parents in need of social services related to anti-social and criminal behavior. Judge Williamson served as the Co-Presiding and Presiding Judge for the 16 Justice Courts in Harris County from 2009-2015 and volunteers her time professionally in many organizations as a presenter. She is a member of the Texas Justice Court Training Center (TJCTC), Education Committee responsible for developing and implementing curriculum for the Texas Justice Court Judges. Judge Williamson serves as a faculty member of TJCTC for new judges school and continuing Judicial Education programs. Judge Williamson is recognized as a leader in truancy law and was recently appointed by Harris County Judge Ed Emmett to the Truancy Committee tasked with recommending a uniform truancy policy for each school district located in the county. Judge Williamson treasures her personal time and is actively involved and volunteers for numerous community organizations. She is married, for 28 years, to Dr. Danny Williamson. They have one daughter, Mary Kate. Mary Kate is a graduate from Texas A&M University with a degree in aerospace engineering. 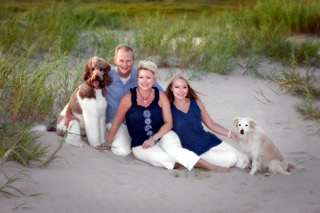 Judge Williamson and her family are active members of St. Martins Episcopal Church. Judge Williamson receiver her Bachelor of Business Administration in Economics from Southwest Texas State University and received her Doctorate of Jurisprudence from the University of Houston. Contribute Online Today by using your Debit, Credit Card, or PayPal Account. Paid for by the Holly Williamson Campaign.